Just as there is a wide difference between bagged teas, the variety of pu-erh (puer, pu’er) tea cakes on the market is fairly astounding. Considering that some pu-erhs are considered collectibles, fakery has also come about. Knowing what to look for and how to make your selection is more important than ever. Green. Black. White. Raw. Cooked. Uncooked. Whatever way they’re prepared, the leaves are those from the tea bush (Camellia Sinensis) and grown in the Yunnan Province of China (the regions of Simao, Xishuangbanna, Boshan, and Lincang) and can be traced back to the Eastern Han Dynasty (25-220 AD). Over the years pu-erh has been traded and used in bartering for goods, with the best being reserved for the Chinese Emperor. The popularity and high prices of older pu-erhs has resulted in truckloads of cheap green teas from nearby provinces being sneaked into the Yunnan area to be processed into tea cakes and sold as pu-erhs. The inferior quality of the tea leaves, though, results in a decidedly inferior tea. It’s not a rotted pumpkin. It’s a pu-erh tea cake! 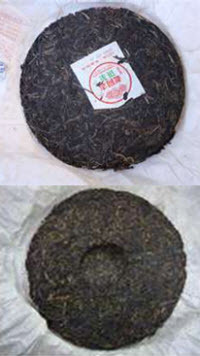 It seems that the most common pu-erh tea cake shape is a disc about the same size as a frisbee. These are usually slightly rounded on the “top” side and have an indent on the “back” side. They are wrapped in paper in a neat pattern that fits the round shape, with the paper ends being tucked into that indent. Each tea vendor has their own printed labels and will mark on that label the year the cake was created. Other popular shapes are bing (beeng) chas, tuochas, mushrooms, and bricks. You can also buy pu-erh in loose form, though some experts claim the flavor lacks the distinctive quality for which pu-erhs are known. There are also some that to me look like pumpkins or melons and others shaped into balls between the size of a baseball and a volleyball. Check the wrapping to make sure it is intact before you open it. Since the tea leaves are steamed and then pressed into the cake and brick shapes, mold (in the form of odd, discolored spots and downy or furry coatings) is a key issue. Insect infestations are another common problem, and are evidenced by small holes or big cracks with fine dust particles in them. Both issues are caused by improper storage. 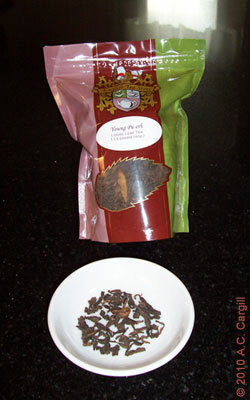 The smell of bad pu-erh tea is usually moldy, rotten, and pungent with a sour undertone and off taste notes. 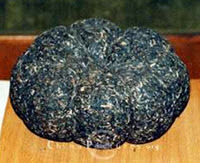 Older tea cakes may be naturally loose due to high oxidation and expansion of internal air pockets. The fake tea cakes that are supposed to be older may appear old but will be hard and compact. True older cakes will pry apart easily. Another issue shows up after steeping some of the leaves. Look for signs of decomposition resulting from high levels of bacteria that cause rapid decay. Also, the taste of a true pu-erh tea cake will be complex, ranging from lightly floral, heather, fruity, and honey-like to leather, harsh peat, tobacco, organics, wood, grass, and deep earth. Pu-erh has been around awhile, so you wouldn’t think there’d be all that much new when it comes to tea cake shapes and packaging, right? Well, actually, a tea vendor recently won several awards at the World Tea Expo for just that. They were judged “Best New Product 2012” for tea cakes shaped and wrapped like chocolate candy bars where you can snap off a single-serving section of tea leaves, and for tea balls (about 1” in diameter) in a bamboo canister, and finally for single-serving size discs in what looks like a Tootsie Roll wrapper. The innovation never ends! More and more, loose versions of Pu-erhs are available. 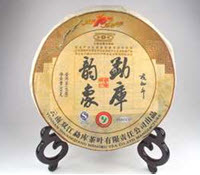 Yes, pu-erh tea cakes are not created equal, but with the right knowledge, you can make a wise choice!